The International Campaign to Abolish Nuclear Weapons, now based in Geneva, is a coalition of grassroots non-government groups in 100 countries and has fought for a global treaty banning nuclear weapons. It is the first Australian Nobel Laureat for Peace, recognised for it “groundbreaking efforts to achieve a treaty-based prohibition”. In July this year 122 countries signed a UN treaty on the prohibition of nuclear weapons, the first legally binding international agreement to prohibit nuclear weapons. But the signatories do not include any of the nuclear powers, nor many of their close allies. This was replicated at the award ceremony in Norway on Sunday in what was described an “ambassador boycott“. Russia was the only declared nuclear power with a top diplomat present. 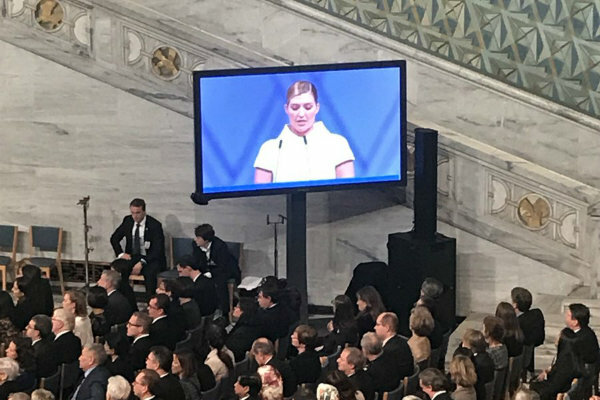 “Australia claims to be committed to a world without nuclear weapons and here’s an Australian-born campaign that has won the Nobel peace prize for the fight against nuclear weapons; it seems a bit silly that they can’t even congratulate us,” Fihn said. Australia has refused to support the ban treaty and prefers to rely on the protection of the United States nuclear umbrella and the nuclear nonproliferation treaty.